Throughout this unabridged audiobook, Nataly describes how she went from being cynical and resistant to the ideas behind self-improvement and spirituality, to studying everything she could on the science of happiness, to completely shifting her mind-set. You'll learn five core practices for building your happier skills--acceptance, gratitude, intentional kindness, knowing your bigger why, and self-care--along with the scientific research that supports each one. 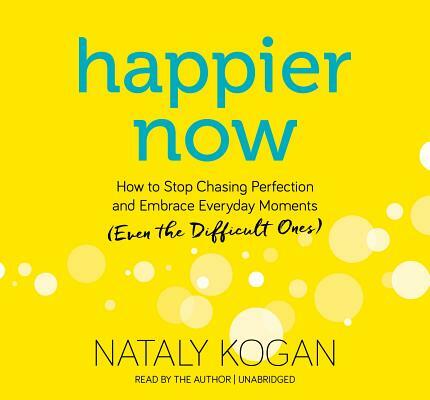 Nataly KoganNataly Kogan is an entrepreneur, speaker, and author on a mission to help millions of people cultivate their happier skills by making simple, scientifically backed practices part of their daily life. Nataly immigrated to the US as a refugee from the former Soviet Union when she was 13 years old. Starting her life in the projects and on welfare, she went on to reach the highest levels of corporate success at companies like McKinsey & Company and Microsoft. When she still found herself unfulfilled, Nataly set out to discover what really leads to a fulfilling, happier life. Her explorations led her to create Happier, a company whose award-winning mobile application, online courses, and "Happier at Work" training programs have helped more than a million people improve their emotional health. Nataly is a sought-after keynote speaker and has appeared in hundreds of media outlets, including the New York Times, the Wall Street Journal, TEDxBoston, SXSW, The Harvard Women's Leadership Conference, and The Dr. Oz Show. She is a self-taught abstract artist and a devoted yogi. Nataly lives with her husband Avi and daughter Mia outside of Boston, although Nataly will always be a New Yorker at heart. For more, visit happier.com.Nataly KoganNataly Kogan is an entrepreneur, speaker, and author on a mission to help millions of people cultivate their happier skills by making simple, scientifically backed practices part of their daily life. Nataly immigrated to the US as a refugee from the former Soviet Union when she was 13 years old. Starting her life in the projects and on welfare, she went on to reach the highest levels of corporate success at companies like McKinsey & Company and Microsoft. When she still found herself unfulfilled, Nataly set out to discover what really leads to a fulfilling, happier life. Her explorations led her to create Happier, a company whose award-winning mobile application, online courses, and "Happier at Work" training programs have helped more than a million people improve their emotional health. Nataly is a sought-after keynote speaker and has appeared in hundreds of media outlets, including the New York Times, the Wall Street Journal, TEDxBoston, SXSW, The Harvard Women's Leadership Conference, and The Dr. Oz Show. She is a self-taught abstract artist and a devoted yogi. Nataly lives with her husband Avi and daughter Mia outside of Boston, although Nataly will always be a New Yorker at heart. For more, visit happier.com.